Dogs of all shapes and sizes love snacks and treats – the more, the better! Mini Naturals natural dog treats are the ideal size for training or frequently rewarding your dog without overfeeding. At just two calories each, every moist morsel is packed full of premium ingredients, including the vitamins and minerals your dog needs to stay healthy. Dog trainers recommend Mini Naturals – they hold their shape in your pocket or bait bag, and no dog will be a bad dog for long when you reward them with the delicious taste of real chicken, salmon or peanut butter. Small size - the perfect dog training treat! Low calorie â€“ At only 2 calories each, Minis are great for small dogs, big dogs and big dogs who could be smaller! Peanut butter, ground barley, ground rice, oat flour, vegetable glycerin, water, fructose, gelatin, carrot flakes, apple flakes, molasses, calcium carbonate, cultured whey, lecithin, minced garlic, acetic acid, salt, natural smoke flavor. Vitamins: C, A, D3, E, B12, B1, B2, B6. Minerals: zinc oxide, niacin, taurine, copper sulfate, selenium, calcium pantothenate, manganous oxide, biotin, folic acid. When should I feed my dog Mini Naturals? Mini Naturals are a favorite among dog trainers! Mix them in a bait bag with Jerky Naturals for great variety. They are great for puppies, small dogs and big dogs alike! 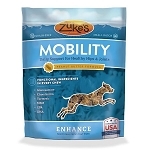 At only 2 calories per treat you can reward your dog often without overfeeding. Mini Naturals are soft enough that you can break them into even smaller pieces, making them the perfect training treat for puppies! 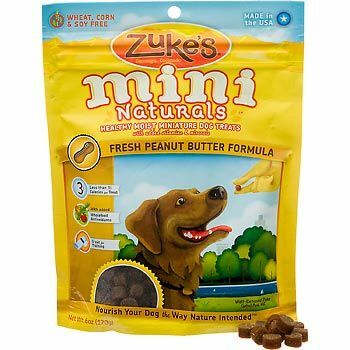 My dog has allergies; can I feed him Mini Naturals? 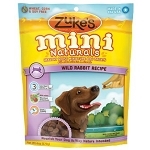 Mini Naturals, like all Zuke's products, are wheat, corn and soy free. If your dog has an allergy to wheat, corn or soy, Mini Naturals may be a great product to try. Help! My dog ate an entire bag of Mini Naturals What should I do? Don't worry – your dog may have an upset stomach and he could have diarrhea or gas, as can happen when dogs eat too much of anything. If you're still feeling concerned, we recommend that you talk to your dog's vet.